GAZA CITY, 1 April 2009 (IRIN) - An estimated 1,346 children were left without one or more of their parents as a result of the recent 23-day Israeli assault on Gaza, according to Islamic Relief in Gaza. 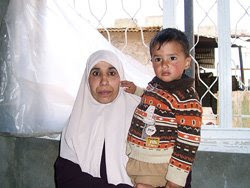 An orphan is defined by Islamic Relief as a child under 18 who has lost the parent considered the head of the household, most often the father, according to a child welfare programme manager for Islamic Relief Mahmoud in Gaza, Abudraz. The official UNICEF definition of an orphan is a child who has lost one or both parents. There are currently about 5,200 orphans under Islamic Relief’s definition in Gaza. “There has been a dramatic increase in [the number of] requests for sponsorship [of such children] in Gaza,” Abudraz said. Over 500 such requests have been made recently and Islamic Relief has responded positively to 200 of them. Eligible orphans must be under 14 and in the care of a low-income family (earning 1,000 shekels - US$240 - per month or less) with more than four members. Extended families in Gaza cannot support the orphans in the long term, said Abudraz. Two-year-old twins Ahmed and Samia (their guardian declined to give their family name) from the al-Tufa area of Gaza City lost their father on 14 January. Their uncle, Mahmoud, is now their primary caretaker after their mother began working as a janitor for 400 shekels ($100) per month. Mahmoud, a former police officer, is now disabled after having been wounded by an Israeli bomb. He and his wife already have seven children, two of whom are also disabled. “I care for the twins as if they are my own, but I only earn 1,400 shekels (about $336) a month [from a disability allowance],” said Mahmoud, standing outside his home, which was shelled during the offensive. The twins receive food coupons and 200 shekels (about $50) each per month from Islamic Relief. About six children lost both of their parents and about 1,300 children lost one of their parents during the recent conflict, according to Baker al-Torukmane, an attorney for the Palestinian Centre for Democracy and Conflict Resolution (PCDCR). The Centre provides psychological and legal counselling for orphans and surviving parents. Al-Salah Islamic Society in Gaza is providing emergency food baskets and 100-200 shekels ($50-100) per month to several hundred of the new orphans. Their website [www.alsalah.org] requests sponsors for the orphans. Other Palestinian NGOs are also providing emergency cash assistance and food packages. The UN Children’s Fund (UNICEF) is currently conducting an assessment of the number of orphaned children in Gaza.